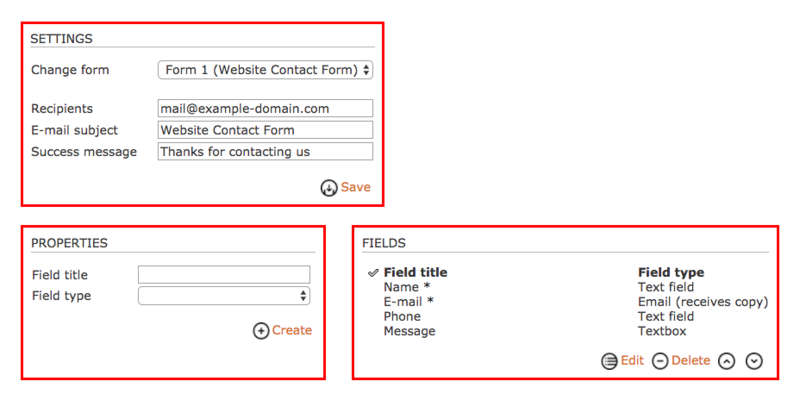 Sitemagic lets us configure up to 10 contact forms. They can be used for things like traditional contact forms, signup forms, surveys, reporting, and much more. Let's assume you have already logged in. First make sure the Contact Forms extension is enabled. Then go to Admin > Contact forms. You should now see something similar to the image below. The Settings section is used to switch between the 10 forms, and to configure the e-mail adress to which the form input is sent, the subject of the e-mail sent using the given form, and what message to display to the user when the form input has been sent. The Properties section is used to create and edit input fields in the form selected in the Settings section. The following field types are supported: text field (single line of input), Textbox (multiple lines of text), Checkbox, Email field (receives copy of the form input), and File Attachment. The Fields section lists the fields already contained in the form. Click on one of the fields to select it, and then use the buttons to either edit, delete, or move the selected field up or down. Once a form has been configured, it will be available as a Page Extension to be inserted into a page. Notice that you might have to configure an e-mail server (SMTP) in order for Sitemagic CMS to be able to send e-mails.